Not to be confused with Lamu. 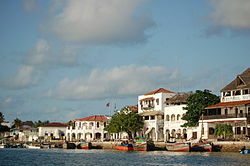 Lamu County is located in the Northern Coast of Kenya and is one of the Six Coastal Counties in Kenya. It borders Tana River County in the southwest, Garissa County to the north, Republic of Somalia to the northeast and the Indian Ocean to the South. It lies 1° 40’ and 2° 30’south and longitude 40° 15’ and 40° 38’south. The County has a land surface of 6,273.1 km that include the mainland and over 65 islands that form the Lamu Archipelago. The total length of the coastline is 130 km while land water mass area stands at 308 km. The County has 2 constituencies namely Lamu West and Lamu East. These two also consist of the two districts referred to as the sub-counties in Lamu County. Lamu West has Amu Mkomani, Shela, Hindi, Mkunumbi, Hongwe, Bahari and Witu Divisions while Lamu East has Faza, Basuba and Kiunga divisions. There are 10 wards, 23 locations, and 38 sub-locations in the Countyn. The main economic activities in the county include crop production, livestock production, fisheries, tourism and mining, most notably quarrying. Among the challenges facing Lamu is population growth owing to migration into Lamu from other parts of the country, fuelled partly by the anticipated opportunities accruing from the Lamu Port South Sudan-Ethiopia Transport (LAPSSET) Corridor. Other challenges include landlessness and poor land management, insufficient social services such as healthcare and education, inadequate supply of piped and fresh water, under-developed infrastructure, and food insecurity. There are extensive mangrove forests in the area. The county is made of cosmopolitan population composed of indigenous communities made of Swahilis, Arabs, Koreni, Boni and Ormas and migrant communities from the rest of the country. The county population as projected in 2012 stands at 112,252 persons composed of 58,641 males and 53,611 females. The LAPSSET project is expected to attract a huge migrant population estimated to be over one million. This will certainly overstretch the county’s social services necessitating commensurate development planning for adequate service provision. ^ Paraxides, Ceti (July 8, 2017). "Nine dead after al Shabaab massacre in Lamu's Jima, Poromoko villages". The Star. Archived from the original on July 10, 2017. Lamu County Commissioner Joseph Kanyiri also confirmed that there had been an attack but said he didn’t have clear information on the number of casualties. ^ "Kenya Census 2009". Scribd.com. Retrieved 2013-12-10. ^ "Lamu County CIDP 2013-2017" (PDF). The Council of Governors. Lamu County Government. Retrieved 10 April 2016. ^ "Urban Poverty All Kenya Provinces". Archived from the original on 18 July 2011. Retrieved 26 May 2014. This Coast Province location article is a stub. You can help Wikipedia by expanding it.